The Hydration Station is the ultimate session of relaxation. It combines Hydrofusion which is the combination of heat and steam with a light display we then add a shot of liquid vitamin to your session. Your skin will be left soft, smooth and glowing! This gives you aroma therapy, detox therapy, skin hydration therapy all wrapped into one 20-30 minute session! Escape from your ordinary life to indulge in this amazing treatment. You also do not have to worry your head is never in the machine. Q: Any prep Or Aftercare? A: If you are getting it before a spray tan please prep normally for your spray tan. If you are getting it for other benefits no prep is needed. We do recommend not showering 4-6 hours after your treatment to help the liquid vitamin concentrates work with your skin tone after your session. Q: What do I bring ? A: You can go into the Hydro Station naked or bring a bathing suit. 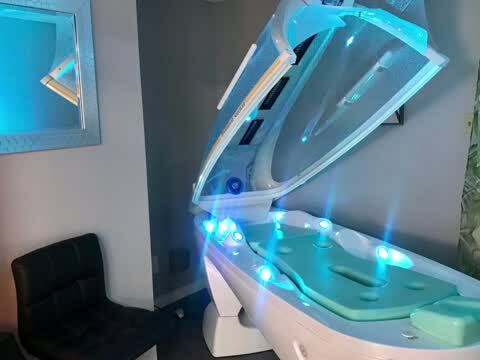 If you are getting a spray tan after feel free to bring a robe or easy slip on clothes to go into the spray tan room after.If you are getting this for eczema or cirrhosis feel free to bring your prescription creams to apply before going in the bed for a deeper effect. Q: Do you have to get a spray tan after a hydration treatment ? A: Absolutely Not! Many benefits come from using the hydration station on top of enhancing spray tan results. Q: Are there any restrictions to using the bed? A: Pregnancy, High blood pressure, heart problems, Nervous conditions (Epilepsy), Kidney disorders or any other conditions that may be affected by steam-sauna like environments. A: If you are getting the prep program before your spray tan it is 20 minutes. If you are using the station for the other benefits it is 30 minutes. Q: Do I get wet? A: You will not be sitting in water. It is warm steam with an oxygen sciences vitamin formula. Your body can get a little damp but dries off as soon as you end your session. Q: In spray tan prep you are not suppose to come with moisturizer on what is the difference between this & a moisturizer? A: The the hydration station is providing steam and radiant heat before your spray tan with a shot of liquid vitamin without putting the oils on your skin a lotion does. This is why it is safe before a spray tan. The liquid vitamin also penetrates deeper into your skin then a moisturizer can.